President Nicolas Maduro blames U.S. hackers for the outages, despite no proof. In Venezuela, the country's most needy are trying to stay alive in hospitals despite little to no power. The emergency room chief at a private hospital in Caracas took ABC News through a dark maze to show the desperation. Parts of the hospital were relying on a generator, but the staff had to conserve power in order to keep patients like Romero Andrade alive. Since the nationwide blackout six days ago, Romero Andrade has been in a coma battling colon cancer. His daughter, Jaqueline Andrade, said the doctors and nurses were treating him using flashlights. The hospital's director said that the hospital was running out of time and that staff had already sent patients home. "I have 67 years," the director said. "Never in my life, I have seen something like this." One patient was so fed up that he shared this message for embattled Venezuelan President Nicolas Maduro, who remains in control and backed by Cuban and Russian allies. 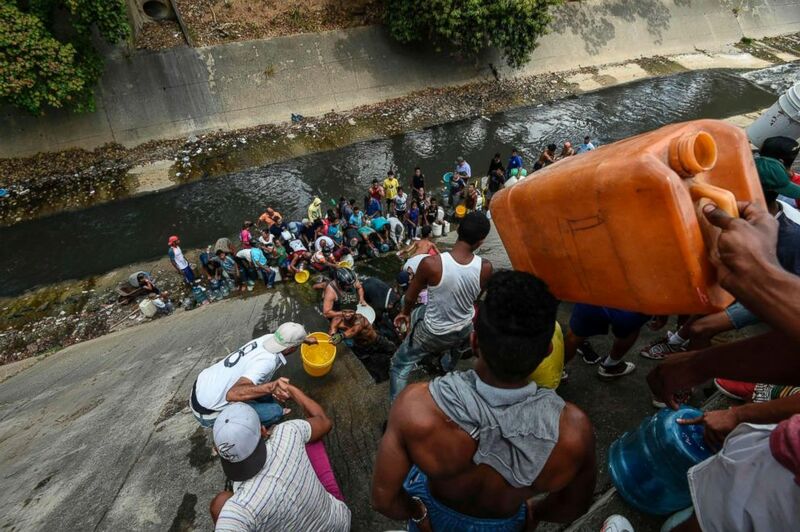 (Cristian Hernandez/AFP/Getty Images) People collect water from a broken pipe, flowing into a sewage canal at the Guaire river in Caracas, Venezuela, March 11, 2019, as a massive power outage continues affecting some areas of the country. "Maduro, go away!" the patient said. According to The Associated Press, several of Maduro's relatives had attempted to cross into Colombia on Monday to escape the blackout. Colombia, which recognizes Juan Guaido as Venezuela's interim president along with more than 50 other nations, denied the family members' entry into the country, according to the AP. 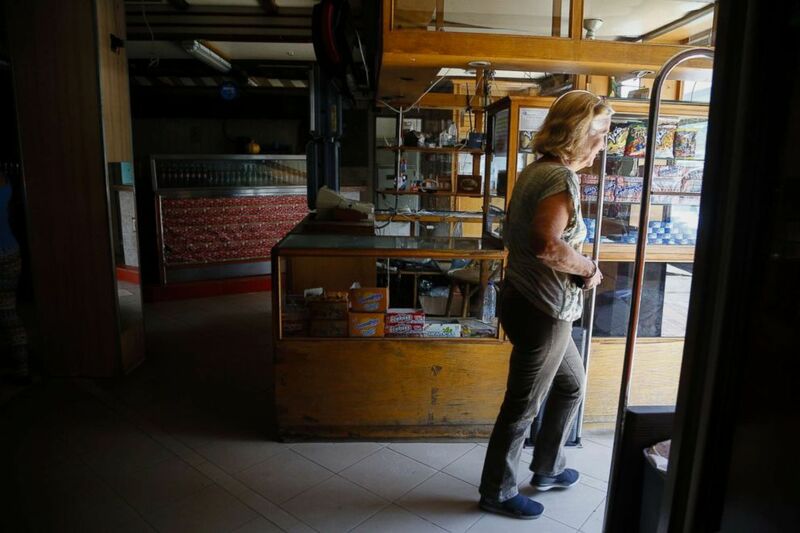 There have been reports of stores being looted and families scavenging for food and water anywhere they can. 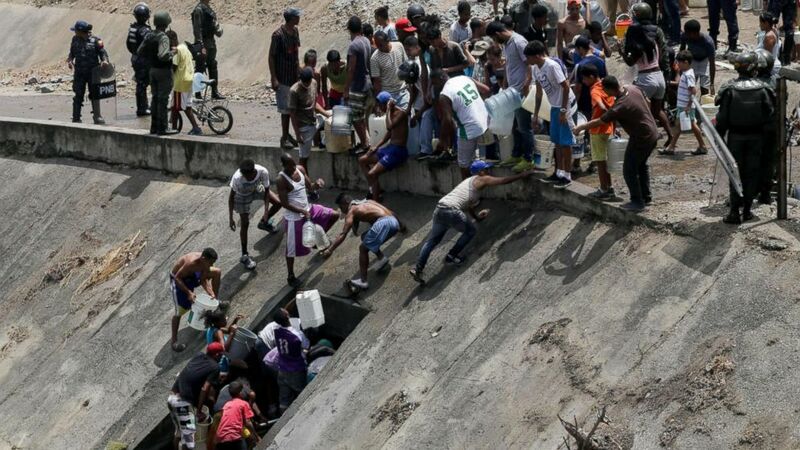 (Juan Barreto/AFP/Getty Images) People collect water from a broken pipe, flowing into a sewage canal at the Guaire river in Caracas, Venezuela, March 11, 2019, as a massive power outage continues affecting some areas of the country. The crisis was on full display at one river, where families got water despite it being polluted. Maduro is blaming the United States. Without proof, he has accused U.S. hackers of sabotaging Venezuela's electrical grid, crippling the nation and leading to chaos. On Monday, the U.S. announced that it was ordering all remaining diplomats from the embassy in Venezeula. The U.S., which is also supporting Guaido, pointed to the blackouts, water shortages and threat of further protests when explaining its decision.